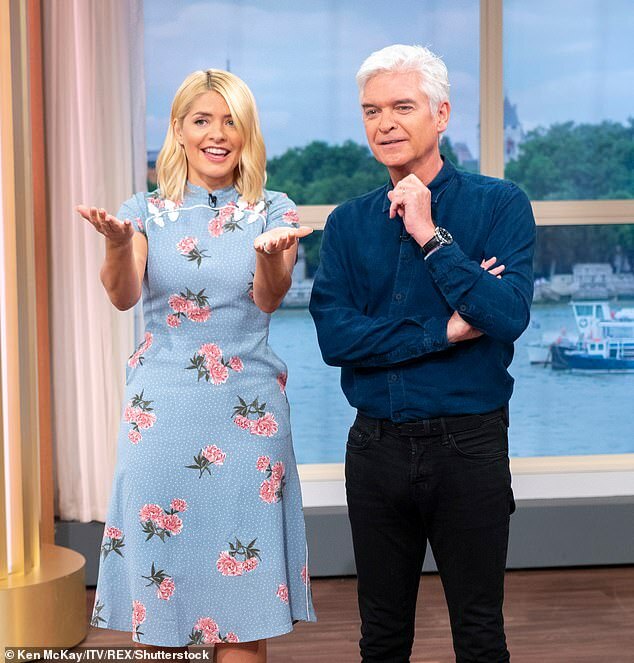 As Holly Willoughby becomes the most powerful woman on television, ITV bosses are worried about how her This Morning co-host Phillip Schofield is taking being eclipsed. Holly, 37, was virtually unknown when she first joined him on the sofa nine years ago but her popularity has skyrocketed thanks to her stint on I’m A Celebrity. The programme achieved its highest ever ratings – 12.1 million viewers – as Holly joined Declan Donnelly in the jungle instead of his usual partner Ant McPartlin. The mother-of-three has also become a fashion icon and amassed 4.8 million followers on Instagram, has a £2 million deal with Marks & Spencer, other lucrative contracts with Diet Coke and beauty products giant Garnier, and is on the brink of doubling her ITV income by signing a new deal worth around £5 million. Although Schofield, 56, is regarded as king of daytime TV, executives are anxious about how he will react to being overshadowed by Holly. A source tells me: ‘The bosses worry for Phil – he was always the more popular one. ‘Holly was there initially as someone who we didn’t really know, so there are fears among those high up that he is finding this tough, that he is upset. Even Holly’s number of Instagram followers is almost double the audience of 2.8 million who watch Schofield’s quiz show 5 Gold Rings – one of his few sidelines away from This Morning. Ever since Meghan Markle crossed the Atlantic to marry Prince Harry, her best pal Jessica Mulroney has been looking for a new gym buddy. Now, it seems that Jess, 38, has found one – in the shape of a punchbag named Igor. The style guru, who helped plan the Royal nuptials in May, last week posed for this picture, left, of her cuddling the hunky punch-bag torso, which belongs to martial arts trainer Jorge Blanco.